← Morgan Freeman knows nothing about evo and Bolivia! NatGeo failed big time! This is a horrendous crime by the “ally” of evo … this guy despises the capitalism and empire … however, he has no remorse by engaging with countries like Iran, Venezuela, Cuba, Russia and China [and used to be friend with the totalitarian regimes of Libya and Syria] … so this sorry excuse of a president has not only wasted our $180 billion dollars from revenues of our exports due to the extremely high international prices, but also engaged with a seven billion dollar loan with China. The latter has opened up the door from hundreds of Chinese to come to our country under the umbrella of questionable and inefficient companies that were brought to build infrastructure under that loan … these companies treat badly Bolivian workers and the Chinese impact our biodiversity with impunity! This is another wrongdoing by the lousy coca caudillo! The above opinion is from Bolivian Thoughts. 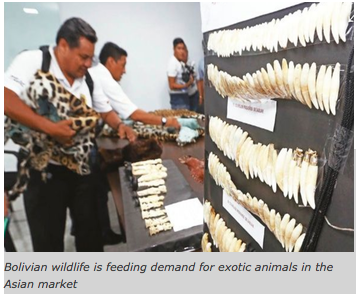 A recent eco trafficking bust in Bolivia involving Chinese nationals demonstrates how the trade in exotic animal parts is being fueled by Asian buyers. The operation followed months of monitoring and investigation and resulted in police confiscating parts from an estimated 54 animals including jaguars, leopards, snakes and armadillos. Two Chinese nationals and a Bolivian were arrested in relation to the case, reported El Deber. The parts were bought locally from hunters and then inlaid with precious stones and metals so as to raise their value in international markets, according to the newspaper. Recent cases have shown Chinese nationals are increasingly involved in the illegal animal trade, sometimes even poaching the animals themselves. Often they will work in areas that are used by drug traffickers and where the Bolivian government’s presence is minimal. In two prominent reserves, for example, there are just 12 rangers to cover the 40,000-hectare expanse. The parts are used in traditional medicine in China and can demand incredibly high prices. In some areas of China, jaguar testicles are said to increase men’s sexual wellbeing and are valued at the price of gold. Teeth and claws are often used as a status symbol to demonstrate wealth and success among China’s rich. Chinese citizens residing in Bolivia will often use the postal service to traffic the parts. In six months in 2014, the Bolivian Forestry Police confiscated eight packages destined for China and containing jaguar fangs. To date, none of the shippers have been convicted. The traffickers can expect a return in Asian markets comparable to smuggling cocaine. Efforts have been made by non-profit groups to reduce the demand for endangered animal parts in China. The International Fund For Animal Welfare (IFAW) has reached out to Chinese celebrities and athletes to produce public service campaigns that address how ivory and other animal parts are sourced. Chinese demand for exotic animal parts is making poaching an extremely attractive enterprise in developing nations like Bolivia. The $400 to $800 paid for jaguar and puma skins is several times the country’s average monthly income. For many rural hunters, the low risk and high reward associated with providing rare animal parts to Chinese buyers has an appeal that can’t be ignored. For Chinese nationals living in Bolivia and acting as middlemen, they have very little legal exposure. The animal parts are procured by locals and processed by third parties. Once ready, the parts are sent through the post without the need for complicated shipping routes. When the goods reach Asia the traffickers can expect a hefty return. Although efforts have been made in China to inform buyers about the origin of exotic animal parts and reduce the demand, the focus has been principally on addressing the ivory trade. Exotic animal parts used in alternative medicine in Asia derive much of their appeal principally because of the exotic nature of the animal. The demand on Bolivia’s ecosystem is likely to continue as long as Asian buyers are willing to pay high prices for animal parts. This entry was posted in Bolivia, Crime and Violence, Environment, Politics, Social Unrest and tagged bad business, biodiversity, corruption in public office, environmental damage, Ochlocracy. Bookmark the permalink.